Nataša Rogelj won a scholarship of Ministry of Culture and finished her Masters in theatre and film set design at University in Prague (DAMU) and at London’s St. Martins School of Arts and Design. Since 2003 she has been working as a professional film set designer and costume designer. 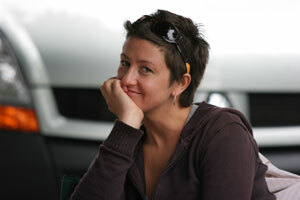 Her work includes the following feature films: Suburbia (orig. title Predmestje, directed by V. Möderndorfer), Tuning (orig. title Uglaševanje, directed by I. Šterk), Tractor, love and Rock 'n' roll (orig. title Traktor, Ljubezen in Rock’n’Roll, directed by B. Djurić), as well as numerous TV series and Slovenian and foreign commerials.